You might have noticed that some things have changed on the FishingTV website and apps. The site and mobile apps are live now and the Smart TV apps rolling out as quickly as we can in the next few weeks. We’ve completely re-built the system to make a number of improvements to the service that we provide, and at the same time given the website a bit of a facelift. So, what’s new, apart from a snazzy new look? Your library, watchlist and all your purchased are still there. However, following feedback from you guys, we have added the following new features. If you’re a big fan of FishingTV this is for you: in the next couple of weeks, we will be launching an unlimited access pass to FishingTV for a whole year for just £50. That gets you access to every video in the collection, and you can watch each video as many times as you like. Big fan of a particular show? Want to buy every episode all at once and save yourself up to 40% on the cost of the whole series? Of course you do. Series Passes will be available selected series – look out for the sticker! We understand that sometimes you want to watch a video more than once, and that sometimes a 72 hour rental just isn’t enough. 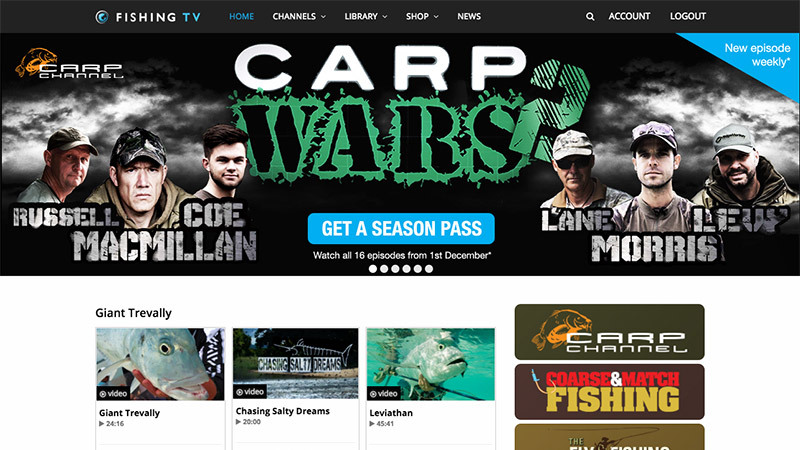 So we’ve introduced a ‘Buy’ option which allows you, for a small fee, to watch that show, series or film as many times as you like, or enjoy Harry Pratt’s Carp Wars victory over and over again. To help you guys to find our amazing content we’ve added a number of new features. The new homepage features some suggested playlists, with some carefully curated content that we think you’ll appreciate. Each channel will also have a ‘Playlists’ tab in which you’ll find some more such collections. There’ll be things like ‘latest videos’, and ‘most popular’, but also some (hopefully) imaginative: “How to”, “Adventure”, “As seen on TV” and more, such as by location, or species. Let us know what you think of the changes, and let us know what sort of playlists you’d like to see!